Ribbons are demure and classic—the perfect finishing touch. 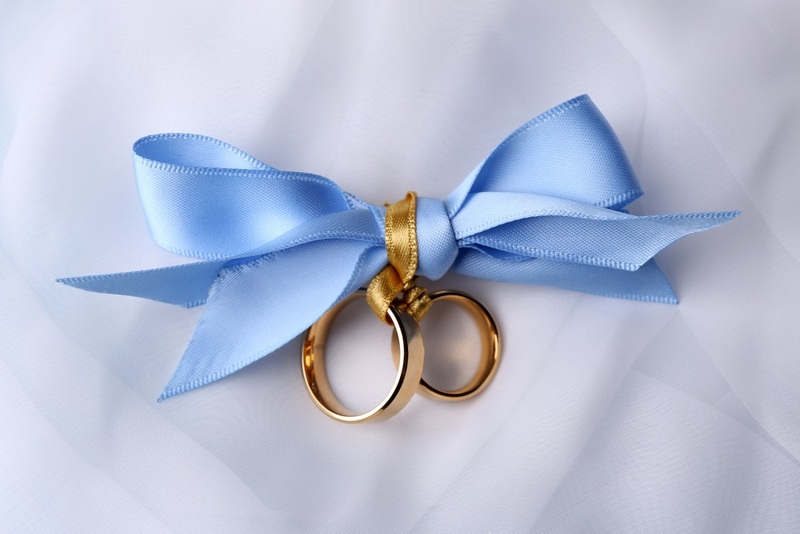 Sweetly simple, yet still chic, a ribbon has the ability to elevate an outfit, a simple hairstyle… or a ring. For the future bride who embraces dainty and exquisite feminine details, present her with a winding and whimsical ribbon engagement ring that ties together the girl she once was with the woman she has become. Celebrate love and timeless romance with a heart-shaped center stone diamond ribbon engagement ring. The 2-carat heart-shaped diamond shines with the light and look of true love. The setting itself features 48 round-cut pavé set diamonds in a swooping and swirling ribbon design, setting off a stately crown mount. Hidden on the ends of the majestic mount are sets of encrusted sweetly elegant diamonds that show off the magnificent center stone. Bezel set stones also hide amongst the ribbon swirls for a sparkling surprise. Ribbons, of course, come in all shades and colors. 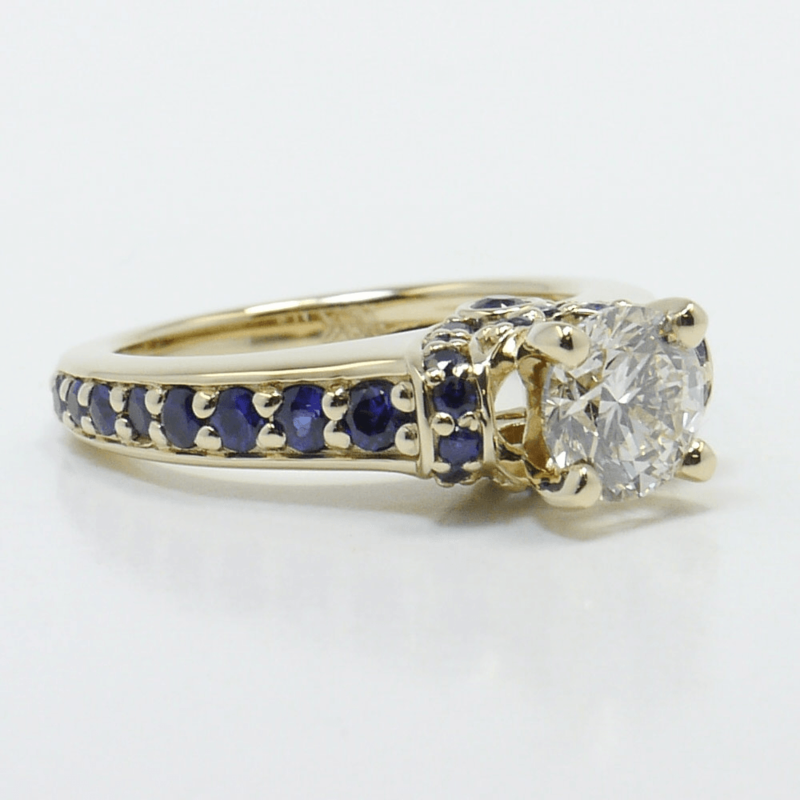 The white-gold ribbon engagement ring setting, with its diamond encrusted swooping ribbon all meeting into tiny knots represented by small bezel set diamonds, could just as easily be designed in yellow gold featuring a glittering ribbon of deep blue sapphires, recalling a beautiful velvet sash. 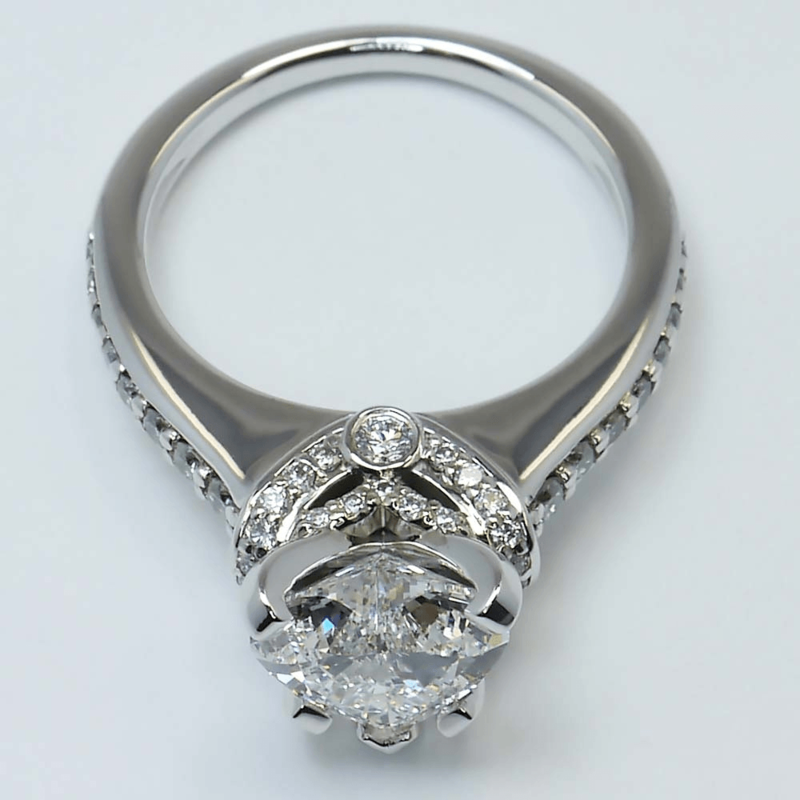 Both setting designs may be topped with your choice of center stone. Choose a round brilliant for a traditional appeal or an emerald or Asscher cut for a vintage look. The bride who loves fairy-tale romance, and who dreams of being swept off her feet by a handsome prince, can find a storybook happily ever after in the Cinderella Ribbon Solitaire engagement ring. The double ribbon design is a nod to the beautiful bountiful bustles in Cinderella’s blue ballgown. 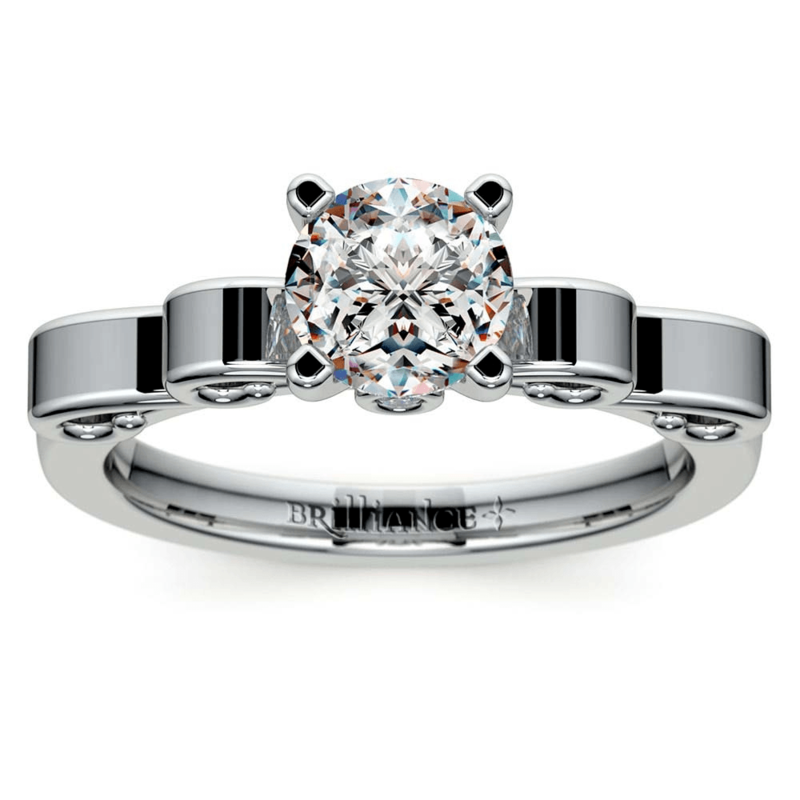 Set in white gold, the solitaire setting features a beautiful and regal crown mount showcasing the choice of center stone. Tucked within the mount are two bezel set diamonds that offer a secret sparkle of fairy-tale magic, like Cinderella’s own glass slippers. Elevate the romance of the ring with a heart-shaped center stone. Ribbon details add feminine beauty and a sweet charm that raises the romance of the simplest of designs. Rings featuring ribbon details evoke fairy-tale images of Cinderella’s beautiful dress as she runs away from the prince when the clock strikes midnight. Or perhaps customized the Cinderella Ribbon Diamond engagement ring with rubies to recall the sweet beauty of Snow White, with a dainty red ribbon tied in her raven black hair. Let us not forget that princesses exist in real life, also. The demure beauty of the ribbon also brings back memories of real life royalty. Princess Diana’s iconic wedding dress, which was marked with a small bow in the neckline of the bodice, remains the epitome of royal luxe mixed with a touch of innocence. Like anything topped with a bow, a ribbon detailed engagement ring offers the perfect finishing touch to an engagement that begins the journey to your happily ever after wedded bliss.